Take Exit 263 (Brooks Gervais – Willamette Mission State Park). Turn right at the end of the off-ramp (Brooklake Rd). Follow west until it ends in 1.7 miles. Turn Right (Wheatland Road) heading north 3.1 miles. 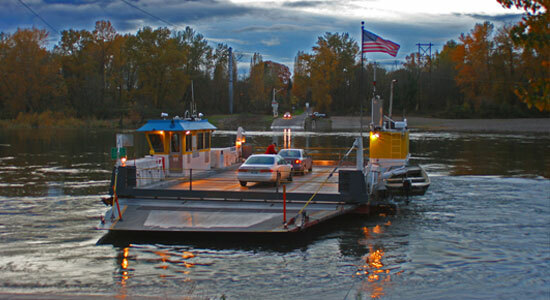 Turn Left on Wheatland Ferry Road, go 0.5 miles to ferry. The ferry shuttles constantly so don’t worry if you miss one. Cost is $2 cash. Exit the ferry, follow the road to Wallace Road (Hwy 221), about one mile. The Eola-Amity Hills are directly in front of you. Turn either right or left on Wallace Road to access the region, depending on your destination. Take the Salmon River Hwy (Hwy 18) heading east for approximately 27 miles. Take a slight right onto Hwy 22 heading east toward Salem. Stay on Hwy 22 for approximately 23.8 miles. Take a slight right turn for Edgewater Street. Stay on Edgewater St. for approximately 1.5 miles. Take a sharp left onto Van Street. Take the next right onto 1st Street. Take the next left onto Wallace Road. Continue north on Wallace Road. You will see the Eola-Amity Hills on your left and can turn onto Orchard Heights Road, Zena Road, Hopewell Road or the Lafayette Highway to enter the region. Take OR-99W heading north for approximately 25.5 miles. Turn right onto Hwy 22, heading East for approximately 7.7 miles.